The claimant (who was 30 years old at the time the claim was resolved) sustained their injury when falling from a lorry. The broken wrist at work injury occurred whilst they were on a training exercise with the British Army. At the time of the accident, the claimant was a member of the UK armed forces. The wrist injury claim value was £12,000 and was paid out to the claimant following a court case. How Common Are Broken Wrist At Work Claims? Slip, trip and fall accidents are the most common form of workplace accident and makeup around 30% of all workplace injuries in the UK, as can be seen in the statistics below from the Health and Safety Executive. The majority of serious slip, trip and fall accidents can cause a broken or fractured bone and 95% of major slips will result in a break or fracture. 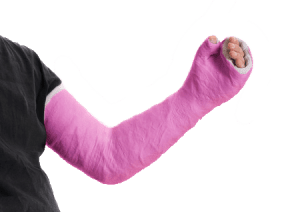 In the broken wrist at work claim case, the judge found that due to the claimants’ deterioration, shown in his need for stronger pain medication and the future requirement for surgery was a high probability. It was alleged that prior to the injury, the claimant was a keen player in several sports such as cricket, rugby and football. He had played these sports to regimental standards. The accident removed his ability to play these sports again and, as well as being unable to play sports and participate in activities with his children, he was restricted to gardening. It was alleged that the claimant also found it difficult to drive a car with a manual gearbox or a car which did not have power assisted steering. The claimant had joined the army as a young man and subsequently left for reasons unrelated to the injury. The only qualification he had was some unqualified training in radio telecommunication and a Class 3 HGV licence. His disability prevented him from working as an HGV driver and his other skills were industry specific to the military. The claimant did find work in a Nuclear Plant which involved heavy work laying cabling. Due to his injury, he was not able to perform this and was transferred to a supervisory role which involved lighter work. Later, he was made redundant. When he was made redundant his net income was £13,500 and had since been unable to find work. As such, the wrist injury claim value took all this into account. What Injuries Were Sustained In This Broken Wrist At Work Claim Case? At the time of the accident, the claimant was 24 years old. They sustained pain and suffering as a result of the injury. As a result of the injury, the claimant sustained a variety of wrist injuries. These included a compound fracture of the claimant’s radius as well as their ulna on the left wrist (their non-dominant side). The fractures were fixed during surgery under general anaesthetic by two wires being placed. After the surgery, the wrist was in plaster for five weeks. Two months after the surgery, the wires were removed. This involved a hospital stay of two days. Three years after the accident, the claimant underwent an examination. At this point, it was noted that the bones had healed and were solid. It was also noted that their alignment was good, but not perfect. There was some distortion at the claimant’s wrist joint. There was also some evidence of their being disruption to the ligaments. The claimant also experienced weakness in their grip and had lost up to half the normal movement range of the wrist, this was taken into account in the wrist injury compensation amounts awarded. Their wrist remained painful and tender. It was passive when manipulated. The claimant was also suffering disturbed sleep due to the discomfort caused by the wrist. This was noted as being worse after a day of heavy work. This was acuter upon waking in the morning. Over time the claimant experienced a deterioration in his condition and had moved on from using non-prescription pain medication. At his examination, he was being prescribed stronger painkillers. The claimant suffered a small injury to the face. Three years later at the examination, this had largely recovered. The claimant was prevented from participating in a range of activities they had previously done, such as activities with their children. It was predicted that the claimants’ condition would worsen in the next 5 – 10 years. It was expected that they would require surgery to stiffen the wrist. This surgery could involve a bone graft which would be taken from the pelvis. This operation and treatment would require a two week stay in hospital as an in-patient. Their arm would also have to be immobilized in plaster for up to 4 – 5 months. The recovery period was predicted to be 12 months after the surgery. How Much Compensation Do You Get For A Broken Wrist? If you have had a broken wrist your first question could be how much compensation do you get for a broken wrist? In this case, the judge took into account the disadvantage the claimant had in the labour market. The judge found that due to their skills, the most significant proportion of job opportunities available involved heavy or manual work. The judge also found that their disability barred them from most of these opportunities and as such, they had reduced employment prospects. Ultimately the broken wrist compensation amount which they were awarded was £12,000. The major causes of broken or fractured bones at work are (according to the HSE) slip, trip and fall injuries. They extend from breaks to the hands and fingers through to fractures and breaks to the major bones. Looking at scaphoid fracture compensation amounts, these cases will look at fractures and breaks in the small bone of the wrist. No win no fee personal injury claims help those who could not afford to make upfront or ongoing payments by providing them with a way to afford expert legal services. At Legal Expert, you will only pay if your claim is successful. This means your costs are recovered from the other party. If unsuccessful, you won’t need to pay a penny. Talk to Legal Expert today to find out how much compensation for a broken wrist at work claim we could get you. Phone Legal Expert today on 0800 073 8804. You can also email us with case details and also use our online chat feature. To find out how much compensation do you get for a broken wrist and average compensation for a broken wrist, see Legal Expert. Get free legal advice for accident at work claims as well as find out how to start your personal injury claim.